Archie Kelly - I want a comedy night! 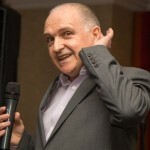 Archie Kelly is best known for his comic portrayal of Kenny “Dalglish” Senior in the award winning Peter Kay’s Phoenix Nights. He has also appeared in a number of popular TV shows including another award winning series, Jimmy McGovern’s The Street However, it is a live performer that Archie excels. An early career as a singer/comedian on the Northern club scene lasted for fifteen years and gave him a wealth of experience on stage as an all-round live entertainer. He emerged onto the alternative comedy scene as Jackie ‘Mr Goodtime’ Valencio with hilarious parodies and superb vocal impressions.. Archie quickly went on to become a headline act in most of the well known clubs such as The Comedy Store. A successful national stand-up tour, Jumping on the Bandwagon, followed along with other Phoenix Night’s cast members. He continues to act and perform regular stand-up and is in much demand on the corporate circuit. A cheeky, inoffensive and highly interactive style has endeared him to audiences both here and overseas.